It’s been a crazy travel year for me. I don’t think I’ve ever been on the road so much, and while I’ve loved it, there’s got to be time in the year for writing and reflection. And in some ways I don’t think I’ve done quite enough of that in 2014. Certainly, I still have a backlog of stories to write about my travels – for this blog, and for publication elsewhere. Thank you to everyone who has followed and read my blog this year, and especially to those readers who have commented on my stories. Your feedback is what makes it all worthwhile, especially when you share your own experiences with me (and other readers) too. As we head for the holiday season here in the southern hemisphere (I’m currently in New Zealand preparing for a family Christmas with my mother, sister and extended family), the sun is shining and the temperatures are rising. But wherever you are in the world – and whatever the climate – I wish you a happy holiday season and look forward to seeing and hearing from you here next year. Meanwhile, here’s a brief wrap-up – in pictures – of my travel year. MULLUMBIMBY, AUSTRALIA: I love markets and all the “stuff” that can be found in them. When I travel, I love to see what the locals are selling off. This year, I’ve been to markets at home in Brisbane, and also in Western Australia and Switzerland. This one, with a decidedly hippie flavour, was in Mullumbimby, in northern New South Wales, Australia. 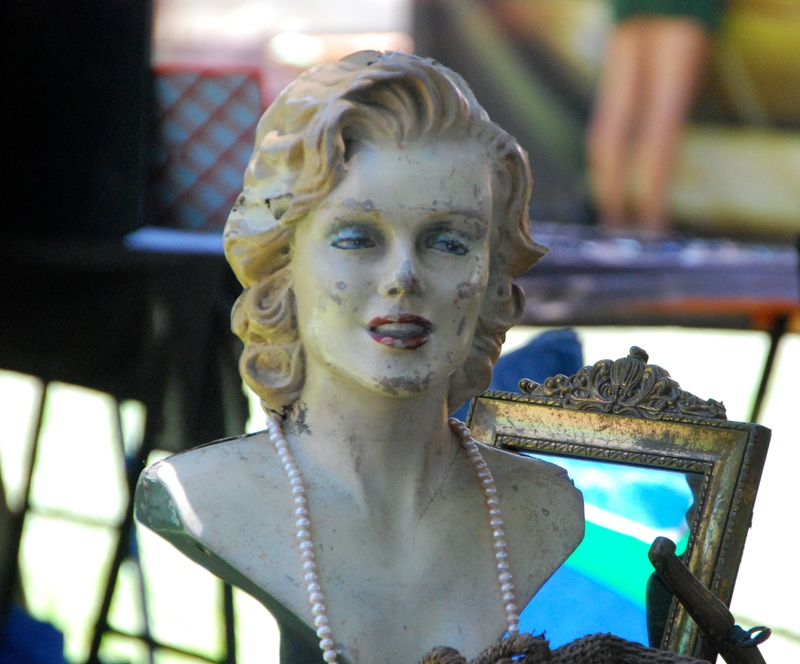 And this great “bust” caught my eye (although I didn’t buy it). 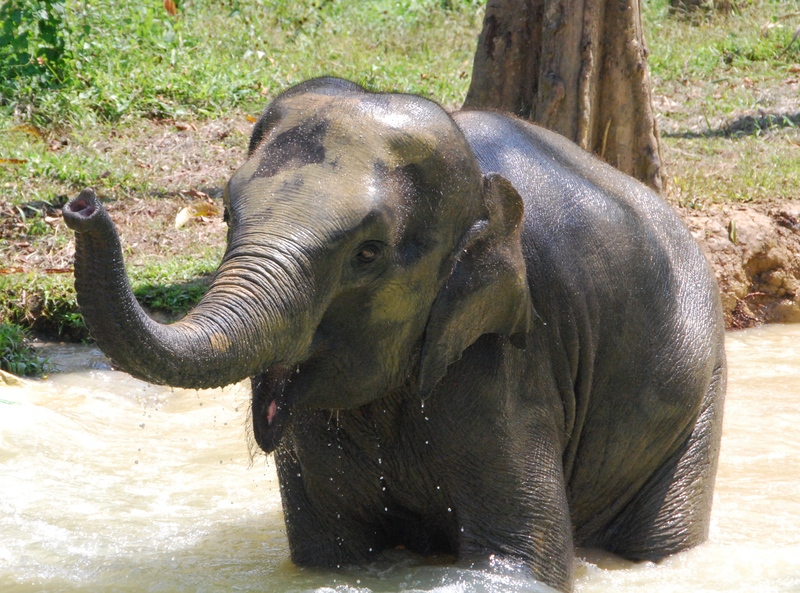 THAILAND: Feeding and scrubbing down elephants after their daily bath was one of the highlights of my visit to Thailand’s Elephant Hills at Khao Sok, which will feature in an upcoming blog in 2015. 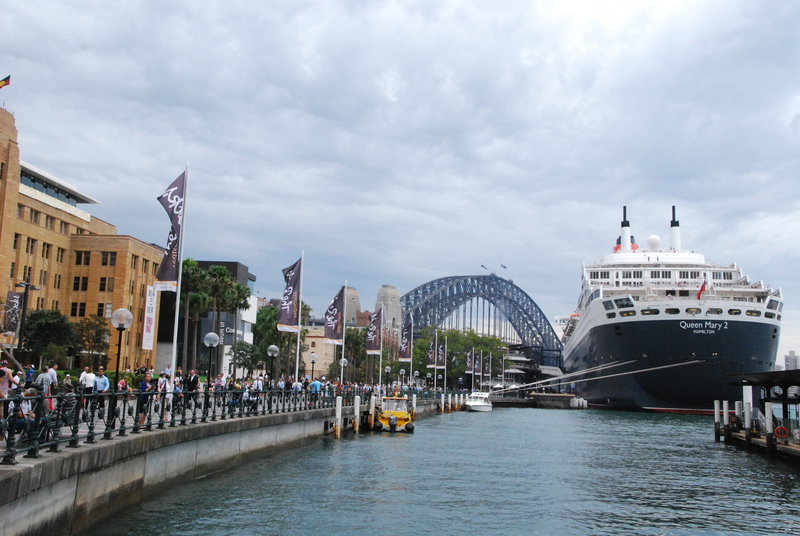 SYDNEY, AUSTRALIA: Sailing from Sydney to Brisbane aboard the luxurious Queen Mary 2 was quite an experience for my daughter Jess and me. The trip took two days and was just a taste of what this huge cruise liner has to offer. If you missed my blog post at the time, check them out here. 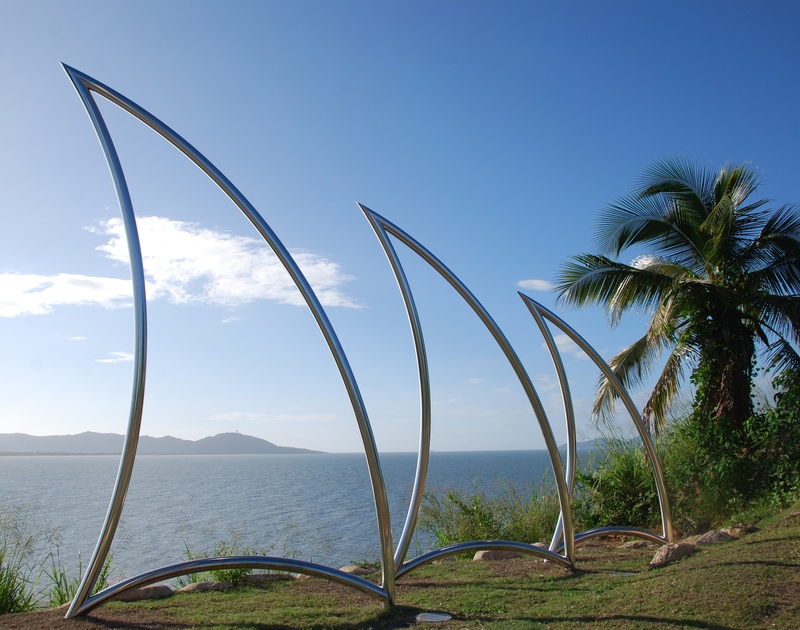 TOWNSVILLE, AUSTRALIA: This tropical north Queensland city this year opened a major redevelopment of its waterfront, incorporating public artworks with a new boardwalk on land previously used as an army barracks. Jezzine Barracks is now a must for any visitor to Townsville. MELBOURNE, AUSTRALIA: I had a wonderful chance to revisit my former neighbourhood in Melbourne during the year. 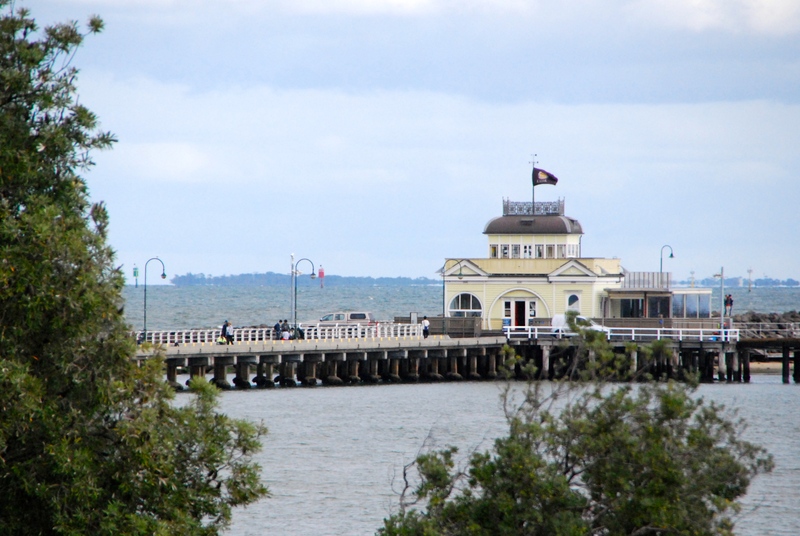 Seaside St Kilda is one of Melbourne’s most interesting locales, with the St Kilda Pier a great place to take a walk and drink in the Port Phillip Bay views. 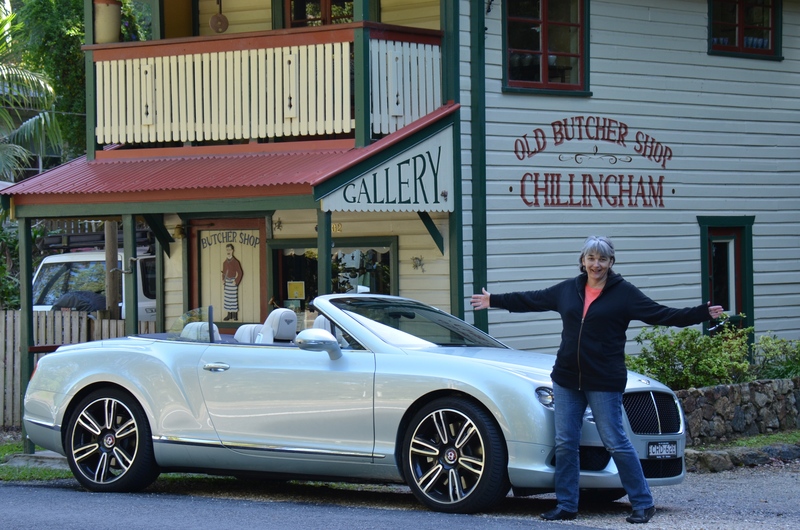 DREAM DRIVE: With the generous loan of a Bentley GTC V8 convertible to cruise in as I researched a story on the villages of the Tweed Valley in northern NSW, I was the happiest driver around. 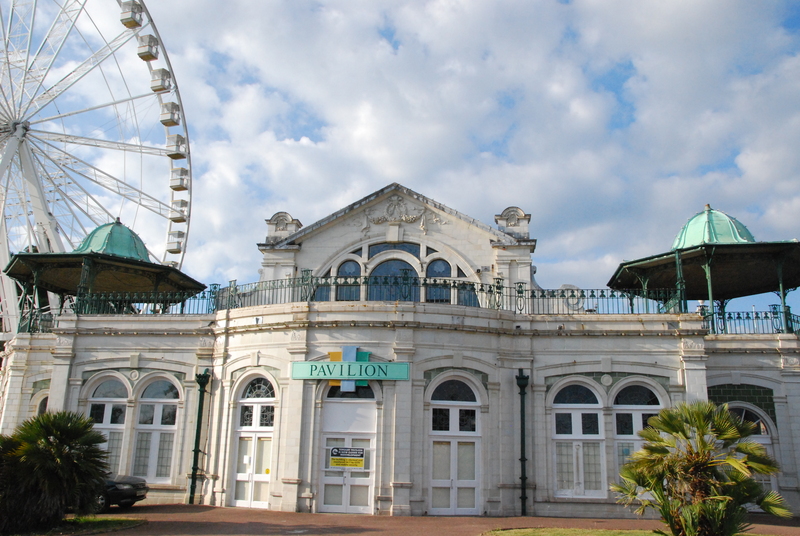 More on this to come on the blog, after publication in a magazine next year. 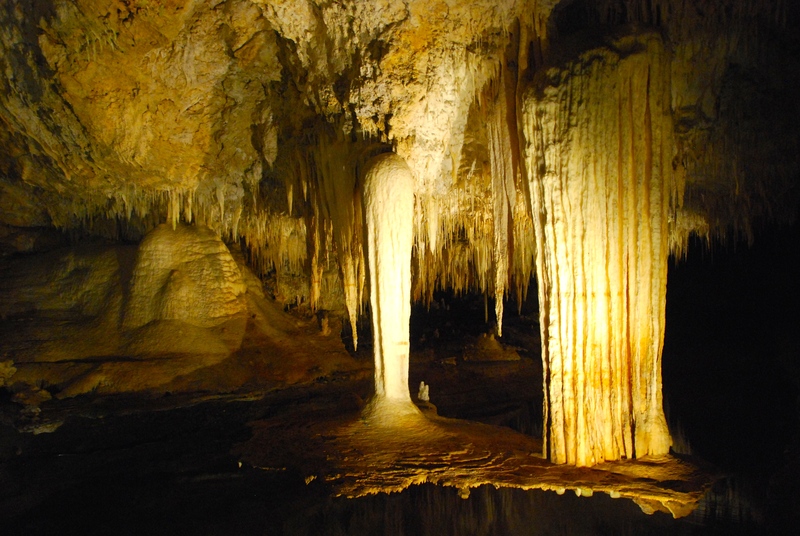 MARGARET RIVER, AUSTRALIA: Exploring the Western Australia wine region of Margaret River, I soon found that there was much more to see than wineries, including the fantastic cave systems. As a guest of the Margaret River Readers & Writers Festival, I saw a great deal of this lovely part of Australia. 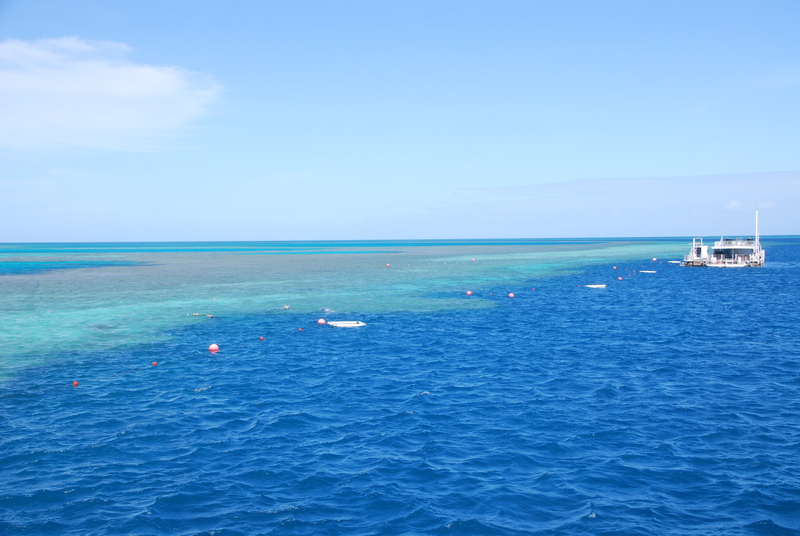 WHITSUNDAYS, AUSTRALIA: Sleeping overnight on the ReefSleep platform on Hardy Reef was a highlight of my visit to the Whitsundays. When the daytrippers went home, a few guests are able to sleep under the stars on the reef platform. Oh those stars…. SWITZERLAND: As a guest of Swiss Historic Hotels, I spent a week in Switzerland checking out several of the group’s wonderful hotels and the beauty of Switzerland generally. 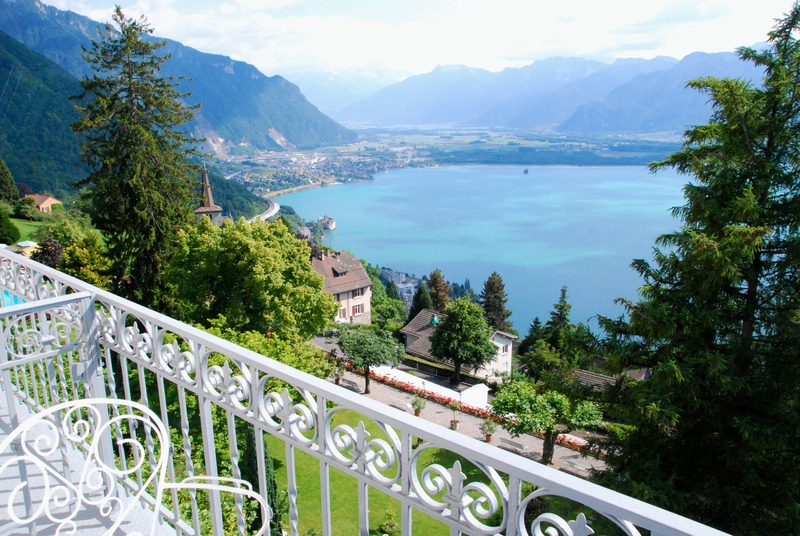 This was the view from the Hotel Victoria at Glion, near Montreaux. 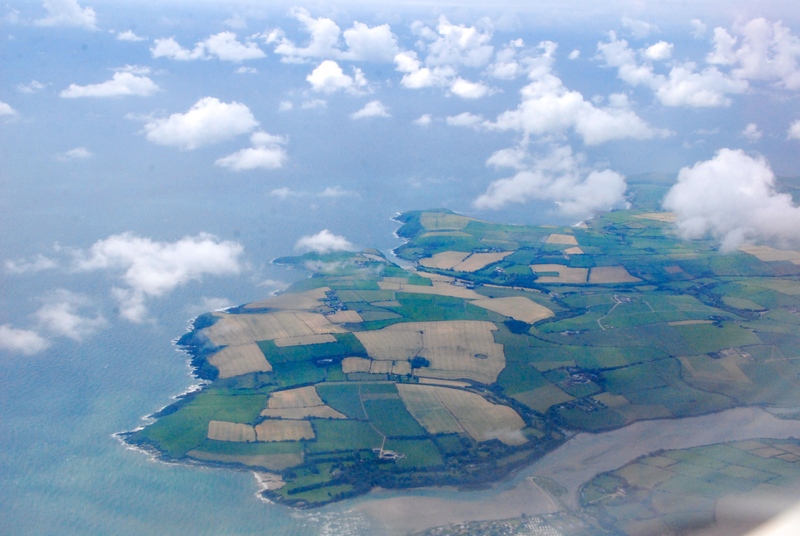 IRELAND: The Emerald Isle lived up to its moniker when I made my first visit there in June. I loved every minute of the week I spent touring the south-west coastal region, following the new Wild Atlantic Way touring route, which covers 2500 km around the coast of Ireland. I drove around 900km and sometimes felt I never wanted it to end. Stay tuned for upcoming posts about Ireland. 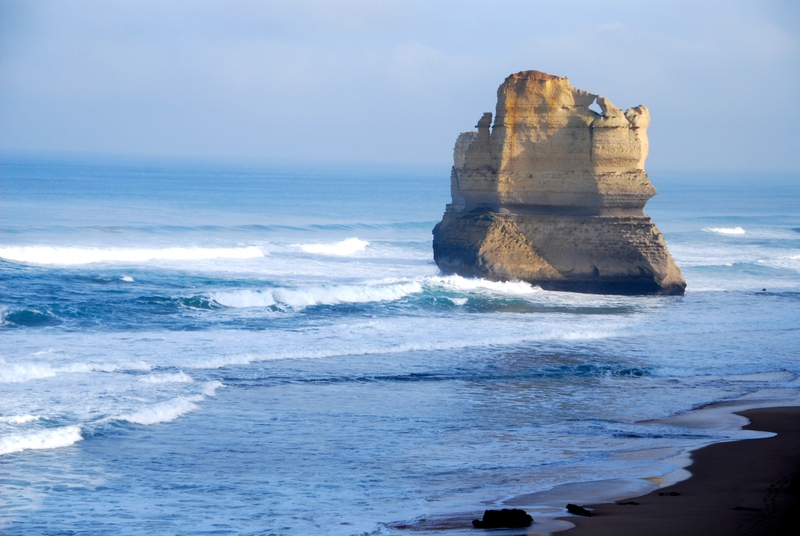 AUSTRALIA’S GREAT OCEAN ROAD: Some of Australia’s spectacular coastline is along the southern coast of Victoria, where the landmark Twelve Apostles stand in the heaving ocean. On assignment for Royal Auto magazine, I was happy to revisit this beautiful part of Australia. TOOWOOMBA, AUSTRALIA: On a quick trip to preview the annual Carnival of Flowers, held in Toowoomba each September, I found much more to like about this Queensland provincial city. 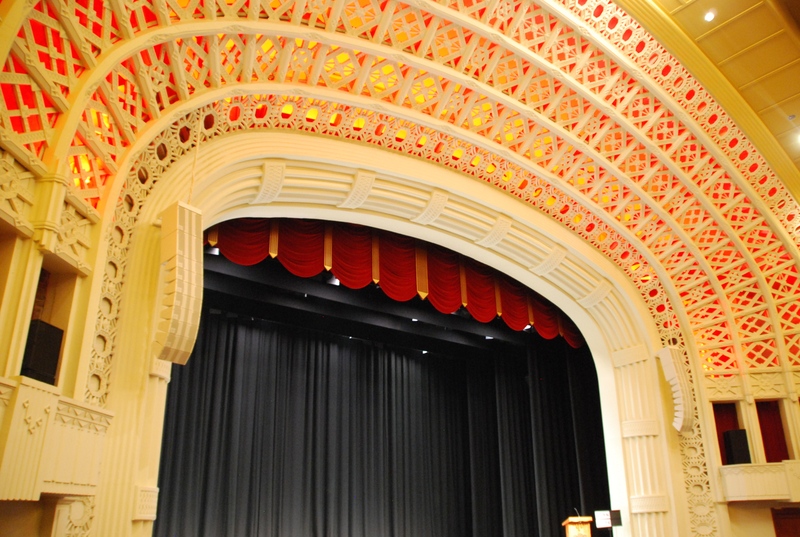 This is the interior of the lovely art deco Empire Theatre, still used for touring acts, including some of the big names in entertainment. BROOME, WESTERN AUSTRALIA: After a speaking gig at Corrugated Lines: A Festival of Words in the Western Australian town of Broome, I lingered for a week to explore more of this remote and exotic part of the continent. 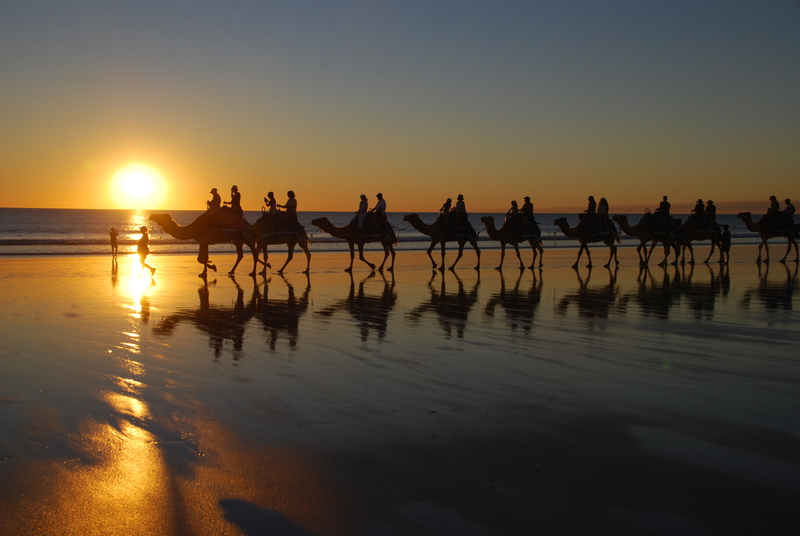 Sunset camel rides along Broome’s Cable Beach are one of the most popular – and photogenic – tourist attractions. 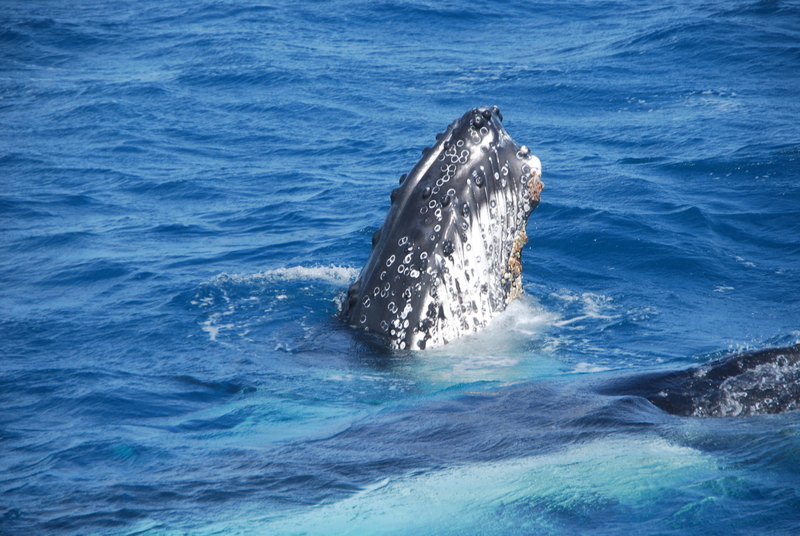 FRASER ISLAND, AUSTRALIA: Whale watching tours operate from August to October each year from Queensland’s Fraser Coast. From a base at Kingfisher Bay Resort on Fraser Island, I was thrilled to see lots of whale action. But Fraser, the world’s largest sand island, has many more delights as you may have read in my series of blogs from the island. 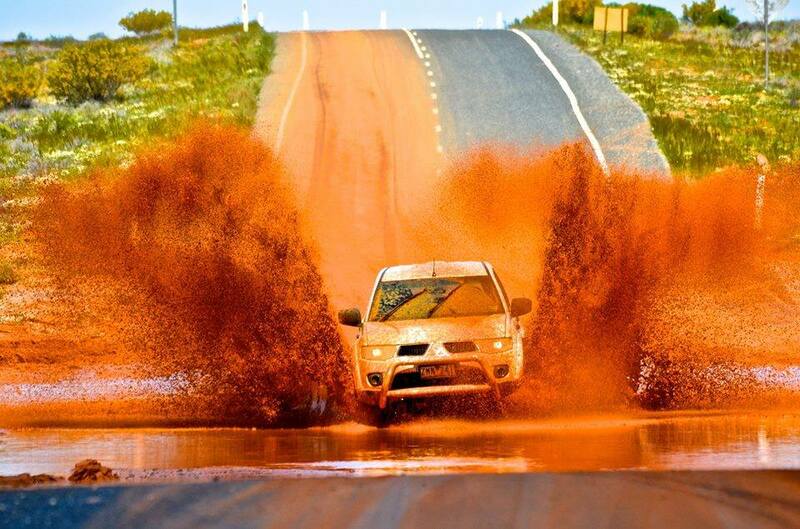 OUTBACK NEW SOUTH WALES, AUSTRALIA: I didn’t take this photo – I was behind the wheel as my photographer friend Richard “Tommy” Campion shot me coming through floodwaters in outback NSW. What a great road trip that was! A highlight of the year (among many), we drove from the silver mining town of Broken Hill to Corner Country (where the state borders of NSW, Queensland and South Australia meet) and back again. Stay tuned for upcoming blog posts about our outback adventures. SUNSHINE COAST, AUSTRALIA: Once again driving a beautiful Bentley (this time the elegant Mulsanne), I headed for Queensland’s Sunshine Coast, north of Brisbane. 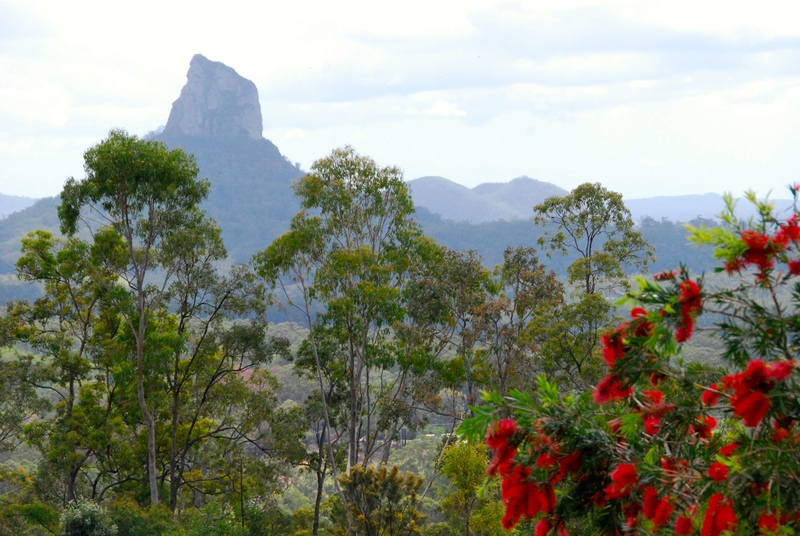 The hinterland region is a green belt of rainforest and cute villages, but the landscape is dominated by the volcanic plugs of the Glass House Mountains. 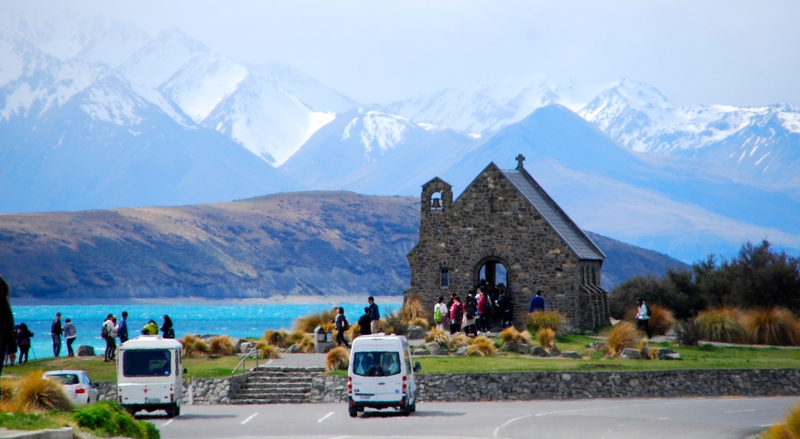 NEW ZEALAND: This is the Church of the Good Shepherd on the shores of Lake Tekapo, in New Zealand’s South Island. A work trip took me by road from Christchurch to Mt Cook/Aoraki and Queenstown, through some stunning scenery and some areas of my native land that I’d not seen before. Just fabulous! 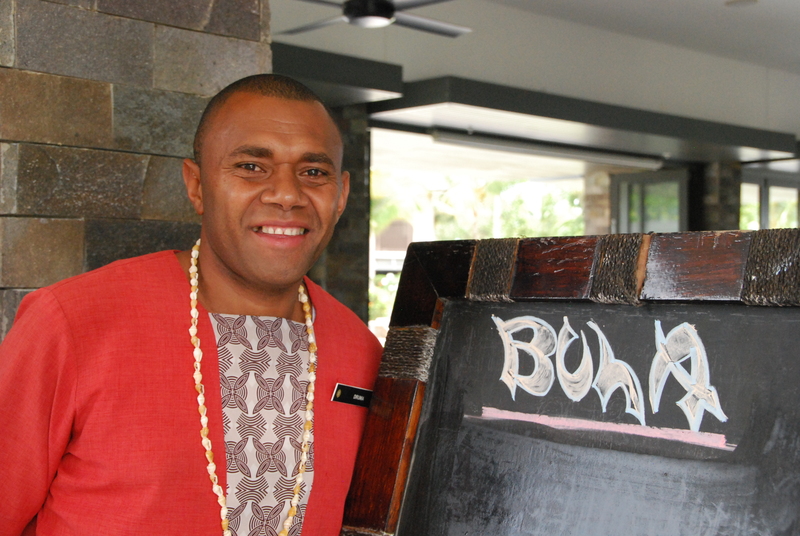 FIJI: “Bula!” was the word on everyone’s lips while attending the Australian Society of Travel Writers annual convention, this year held in Fiji at the Intercontinental Fiji Golf Resort & Spa. TROPICAL NORTH QUEENSLAND, AUSTRALIA: Exploring the Atherton Tableland and the Cairns region brought my year’s work travel to an end last month, and provided me with lots of great material for blog posts in 2015. 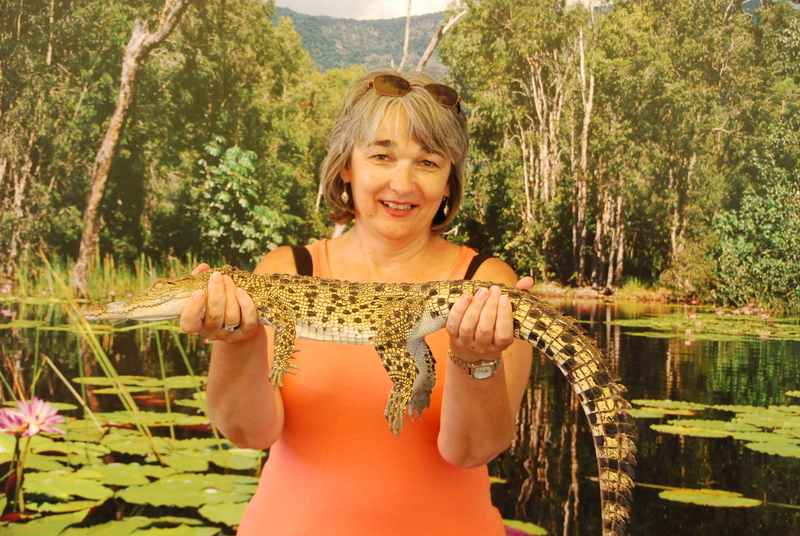 At Hartley’s Crocodile Adventures, near Port Douglas, I wrestled this crocodile into submission (OK, his tiny jaws were taped up to stop him biting the visitors). NORTHLAND, NEW ZEALAND: I finished my year of travel on a personal trip to New Zealand for Christmas. I saw this stunning sunset last week from my mother’s house. Happy New Year to all! See you out on the road somewhere in 2015! I sure hope so, Goddess! Indeed it was! I think I might stay home a little bit more in 2015…but you know what they say about the best laid plans! Fantastic, Lee. What a charmed life. Travel. Write. More travel. More writing. Lots of travel. Lots more writing. And so on and so forth. Well done. Look forward to your next year of travel. Happy New Year. Thank you Tommy. Happy New Year to you too. I hope you’ll also be travelling a bit in 2015, so we can see some more of your fabulous pix. No Lee, I am staying home for the next 12 months. Going nowhere. Home or away, I’m sure you will still be shooting wonderful pix. My, what a busy year! Great to see you in Whangarei and hope our paths cross again soon – maybe even in Brisvegas in February! Great to see you too Kerry! Wish you calm waters and lots of adventures. Look forward to seeing you again somewhere in the Pacific! Thank you! Look forward to reading about your travels in 2015. Whangarei has changed a bit since last time I spent a Christmas here (for the better!). What a fabulous year and what fantastic photos, Lee. 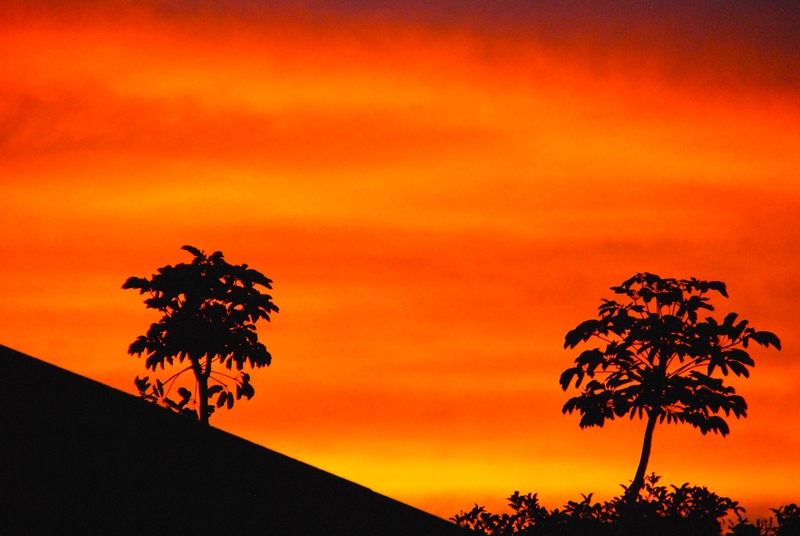 The camels, the whale, the NZ sunset – so many amazing pics …! Thank you Christine. I’ve had a busy, interesting year and enjoyed it immensely. Happy 2015 to you and yours too.